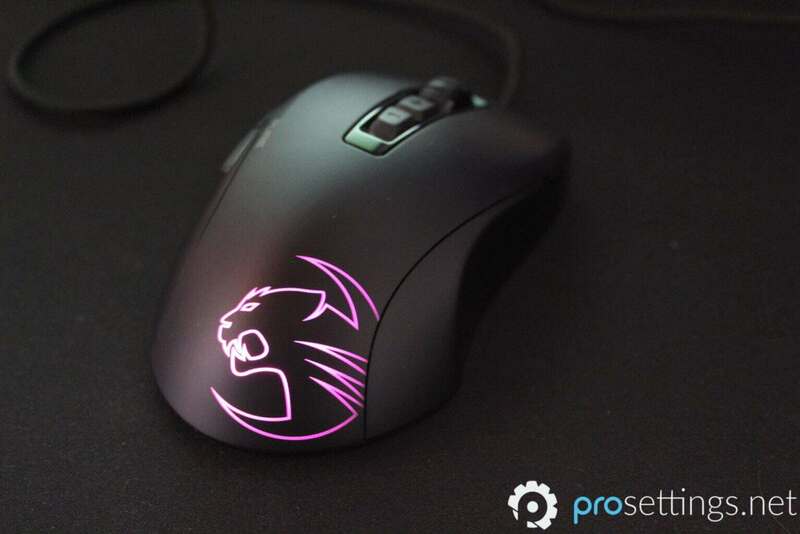 Roccat is a company that’s been releasing mice for a while now, which is evidenced by the fact that they have seven different lineups of gaming mice, ranging from modular MMO mice to Batmobile-looking wireless mice. 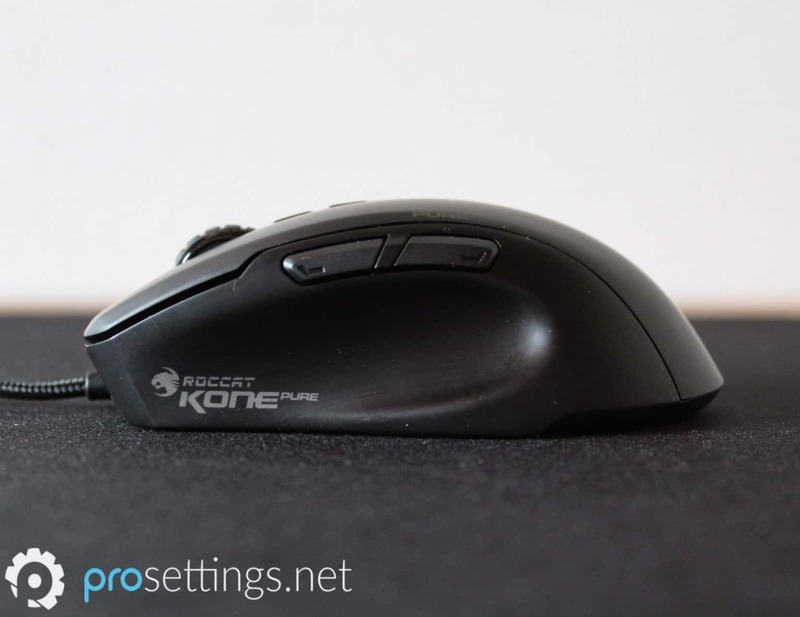 One of their most popular products is the Kone line of mice, due to their excellent build quality and attention to detail when it comes to performance, even though the shape is very much a ‘love it or hate it’ kind of deal. One of the newest members in the Kone family is the Kone Pure Owl-Eye (friends can say ‘KPOE’) which features some improvements (cable and sensor, mostly) over its older brothers, so we thought it was a good idea to let our hawk-eyed mouse reviewer take a look at the Kone Pure Owl-Eye. Is the KPOE worth your hard earned cash? Will we ever find out why it’s called Owl-Eye? Find out in our review below. One of the first things you notice when you connect this particular mouse is that it is indeed a gaming mouse. The KPOE doesn’t look like a transformer mid-transformation or anything like that but when compared to most other mice that I’ve reviewed on this website so far it does look a bit more ‘gamer-ish’. Is that a problem? No, not at all, but it’s something that I noticed and since I’m talking about first impressions here I thought I’d mention it. 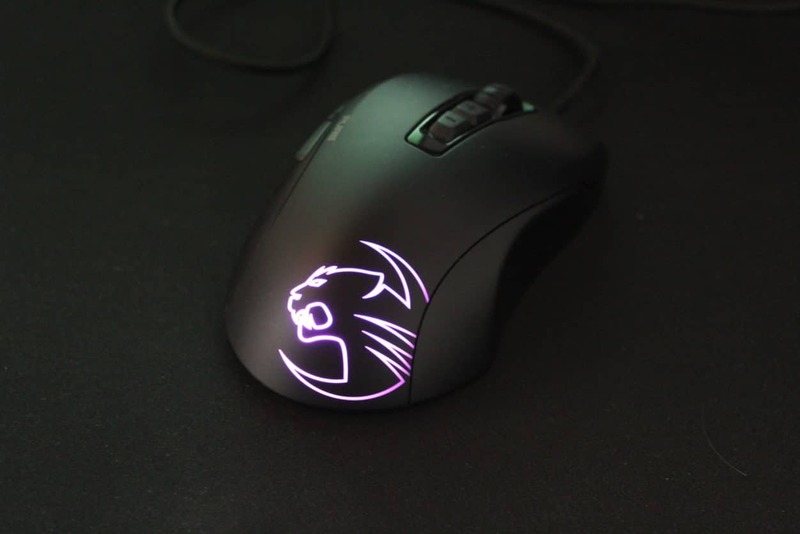 The KPOE comes with fully customizable RGB lighting (the Roccat logo towards the back of the mouse lights up) and has some rather subtle branding on the top left side of the mouse and towards the front. The RGB lighting is nothing to write home about, but it looks nice enough for the people who care about that sort of stuff. The Kone Pure Owl-Eye isn’t the largest mouse on the block (take a look at the EMP if you want a larger sized Kone) which means it’s not very heavy either. I weighed it at 88 grams with a tiny bit of cable. It’s an ergonomic mouse with lots of ‘shape to it,’ so if you’re looking for a super neutral feeling mouse this one won’t be for you, but people who love mice which are very formed and curvy will be giddy with excitement when they first hold the KPOE. The KPOE is about 6.8cm in width, a little under 4cm at its highest point and and it is 11.5cm long. That’s not the smallest of mice, but due to the design of the shell I wouldn’t really advise anyone with above average hands to get it unless you’ve tried it out in person first. The box which contains the KPOE wants to make damn sure that you know you’re buying a gaming mouse. It’s filled with specs and accompanying marketing speech, with ‘champion grade’ featured as a sort of tagline for the product. Inside the box you’ll find the mouse, a bunch of Roccat branded stickers and the usual info booklets. 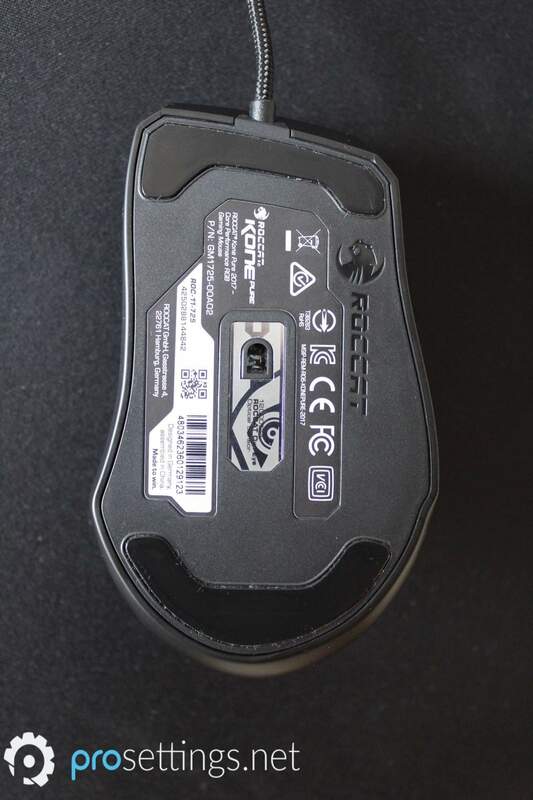 There’s not much to the packaging of the Kone Pure Owl-Eye, but then again this is by far the least important aspect of a gaming mouse. The KPOE is an ergonomic mouse, and it has one of those ‘love it or hate it’ designs. There are lots of curves and indentations, with the most notable feature being the rather deep thumb groove on the left side of the mouse. If you grip it in a way that your thumb somehow doesn’t end up in said groove or you don’t like the feeling of it then you’re out of luck, since there’s not a lot of real estate to hold the mouse elsewhere. If your hand and/or grip style does fit the shape of the mouse it’ll feel like it’s molded to your hand however, but you can’t have large hands if you want that to be the case. I have 18.5×10 cm hands and the mouse feels just a little bit too small for me, if you want a reference point. I did really enjoy the shape, and I can imagine that people with slightly smaller hands who are into these very ergonomic designs will feel as if this mouse dropped down from the heavens. The coating on the KPOE does what it has to do. It’s got a glossy black coating that holds up well throughout hours and hours of gameplay, but it does tend to pick up on sweat and skin oil a bit too quickly for my liking. It’s not a big deal (and doesn’t affect performance at all) and this is easily fixed by wiping it down with a cloth, but that’s something that they could improve on. On top of the mouse there’s two buttons to switch between DPI modes (Roccat’s Swarm software features an option where you can have a voice tell you what DPI you’ve switched to by the way, which I thought was awesome) and on the bottom of the mouse there are two large sized mouse feet which provide a pretty controlled glide. No issues with the feet whatsoever. Roccat has teamed up with Omron for the switches underneath the KPOE’s buttons, and these buttons feel great. They’re easy enough to press (but they’re not hair-trigger light either, which is a good thing in my opinion) and they offer clear tactile feedback whenever they’re pressed. The right mouse button on my unit does sound a bit more hollow than its neighbor to the left but they don’t feel any different when I click them, so that won’t take any points off of Roccat’s tally as far as I’m concerned. So the buttons are fine and they do what they have to do, but the star of this segment is without a doubt the scroll wheel. The KPOE has one of the best scroll wheels that I’ve used over the past few years. It’s a very light wheel but the steps are all defined super nicely and the wheel itself is easy to press. Whether you use your wheel to switch weapons or bunnyhop around; you’ll no doubt be satisfied with this one. The side buttons don’t have a lot of travel time at all and give you a nice clicky feeling when pressed so that’s another aspect that Roccat got right on this mouse. In summary: the KPOE has excellent buttons which will please most gamers out there (unless you need super heavy or extremely light clicks) and puts a cherry on top of the cake in the form of the phenomenal scroll wheel. 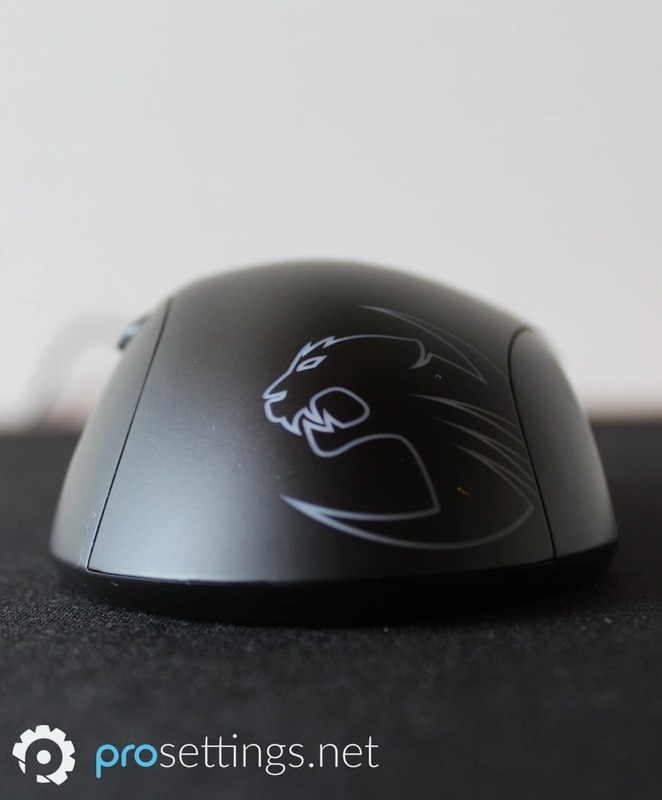 As with most (if not all) of Roccat’s mice the KPOE is built really well. There’s nothing loose inside the shell and even when tapping the mouse against the pad it makes no noise it shouldn’t be making. It always annoys me when I hear of feel something rattling inside of a mouse so it’s a good thing that the KPOE seems really well built. When I first saw the cable I was pretty horrified as it’s a braided cable, but unlike most braided cables this one is actually pretty flexible. It’s not the best cable out there but it almost never bothered me throughout my testing period, and when it did I just put it in my mouse bungee, so as far as cables goes this one passes. Even if you don’t own a bungee you’ll find that there’s minimal interference from the cable when playing games, though you will obviously still feel the cable every now and again. 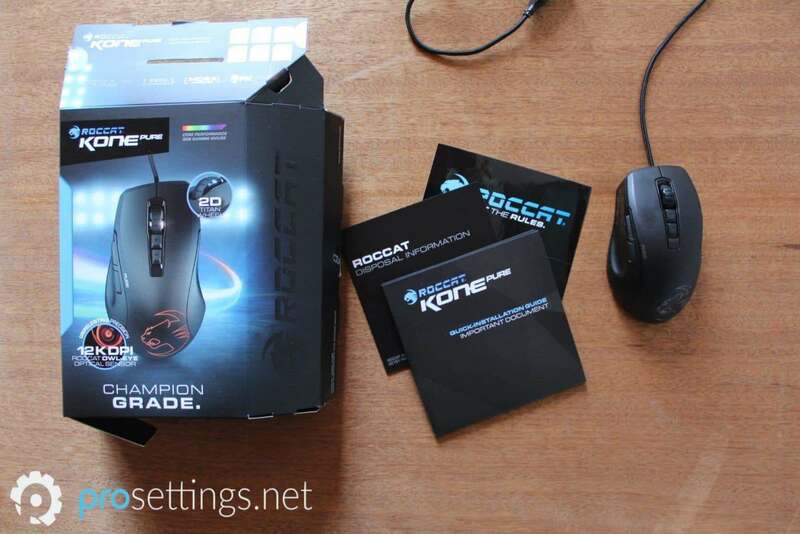 Roccat states on its website that the Kone Pure Owl-Eye uses the ‘Owl-Eye Optical Sensor’. That sensor is basically Roccat’s version of the Pixart 3361, which is known to be a flawless sensor. It goes up to 12000 DPI, though Roccat recommends (on their website) to go for something a more reasonable DPI setting in the range of 400-3000. Props for that, as there’s absolutely no need at all to use a ludicrously high DPI setting. Roccat’s Owl-Eye Optical passed my testing with flying colors, as expected. There’s no smoothing, skipping, or any of that nonsense, which is what we’ve all come to expect from modern top tier gaming mice. The KPOE translates your movements to the game perfectly, and that is exactly what you need if you’re a serious gamer. The KPOE has on board memory and works out of the box (with a set number of DPI stages, of course) but if you want to you can download Roccat’s Swarm software where you can tinker with just about everything. There’s also the possibility to create macros and all of that jazz, and the software itself is easy enough to navigate. The KPOE is a pretty small and curvy mouse, which naturally means that it won’t be for everyone. Straight off the bat I’d say that people with large(r) hands should really try to hold a Kone model before purchasing it as the shape can really interfere with the quality of the grip if your hands are too large for the mouse. If you’re looking for a mouse with a super safe or neutral shape then you’re better off skipping the KPOE altogether. Don’t mistake the prior paragraph for something negative though. The KPOE isn’t a mouse that’s going to be suitable for 99% of gamers like some of the super safely designed mice out there, but that’s not a bad thing at all. Most top ergonomic mice are at least medium sized, so it’s good to see that Roccat is offering an ergo mouse for people with smaller hands, and despite the fact that the mouse was just a tiny bit too small for me I did really like the shape overall. All in all the KPOE will work fine for most grip types if you’ve got small to medium sized hands. If you like the shape and premise of this mouse but have larger hands you can always take a look at the Kone EMP. 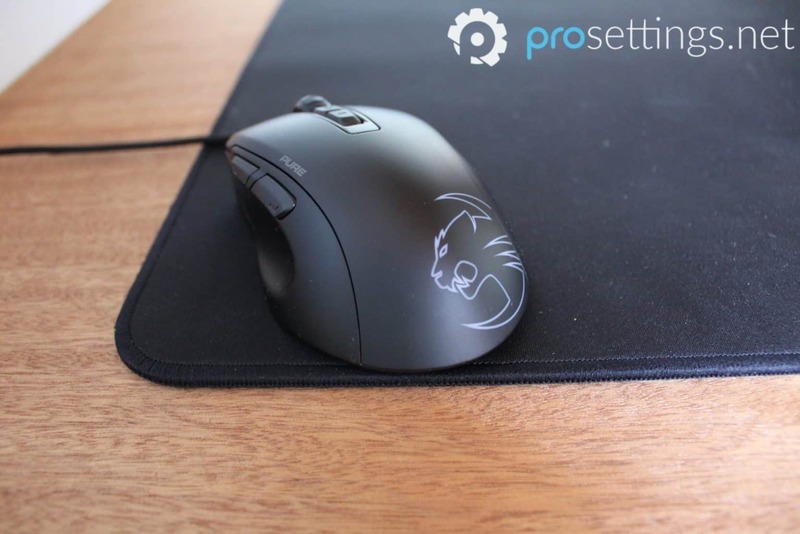 The Roccat Kone Pure Owl-Eye is a great mouse which hits the mark on almost all fronts. It seems most people either love or hate the shape of this mouse, but if you happen to love it (and your hands aren’t too big for the KPOE) you’re looking at a long and satisfying relationship with this mouse. The clicks, ingame performance, and build quality of the KPOE are all great, with a very special mention to the scroll wheel, which is one of the best wheels I’ve used in recent years. The only downsides I could find on this mouse are the fact that I’m not a big fan of the coating and that the cable could be just a bit more flexible, but aside from that it’s a top performer on all fronts, even if it’s just a bit too small for me personally. If you’re someone with small to medium sized hands and you’re looking for an ergonomic mouse with some real curves to it then you owe it to yourself to take a gander at the KPOE, since it’s nothing short of an amazing mouse. Will this work for a claw grip, 16 by 9 cm hands? That should fit just fine I think, provided you like these kinds of shapes. We are always reviewing new mice. Watch out for more reviews coming soon. Great review, I own this mouse myself and love it. Thank you, glad you like it and it’s a great mouse indeed. Would this mouse be good for around 18×9 hands palm claw hybrid grip? My hands a just a bit larger than yours and I found it to be a bit too small personally so it might very well be that it fits you like a glove. This stuff is all super subjective though so I can’t really say with certainty. is there any pro that you know using kpoe ?